Why visit Belfast from Dublin? Belfast in Northern Ireland is part of the United Kingdom and is just two hours away from Dublin (Dublin to Belfast distance is 171 km or 106 miles). Belfast has a reputation for being a rough destination because of the “Troubles” between Catholics who generally want independence from Great Britain and Protestant loyalists who wanted to remain part of the UK. The Troubles peaked in the 1980s but today, Belfast is an elegant city with great bars and restaurants. There are plenty of things to do in Belfast to fill a weekend city break from Dublin. You should bring your passport if you plan to visit Belfast since the Republic of Ireland and the United Kingdom are separate countries. There is no hard border between the Republic and the North but you may be stopped and asked for your passport at any time. We’ve visited Belfast on four separate occasions and on one of our trips, the bus was pulled over for a document check and someone was taken away because they didn’t have the correct papers. 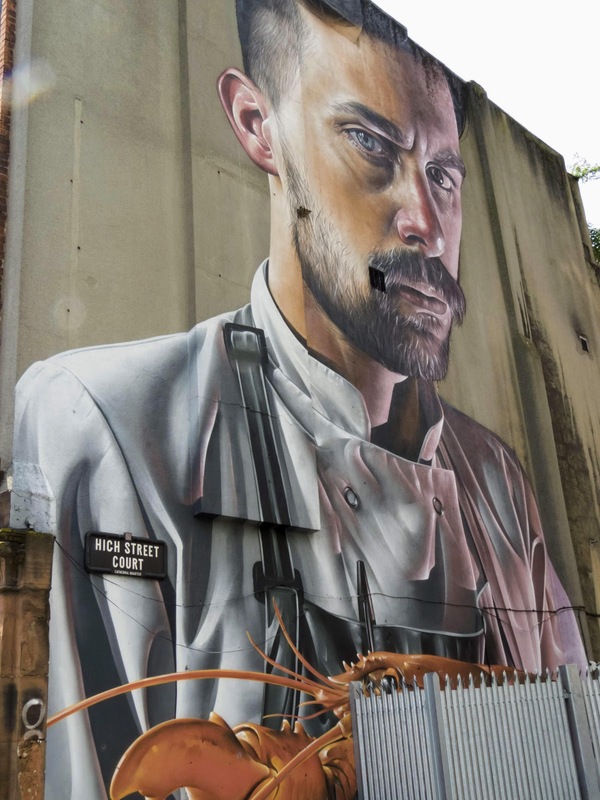 Belfast boasts predominantly Victorian era buildings with a sprinkle of Art Deco mixed in. A Tesco supermarket was built in the former First Trust Bank. I'm inspired by the work Tesco did to preserve the elegance of the space. Ulster Hall (home of the Belfast City Council) sports a colorful crest on top. Life in Belfast centers around City Hall with green space surrounding the impressive facade. Ulster History Circles dot the city of Belfast and explain some lesser known events and characters. My favorite was the Ulster History Circle for John Boyd Dunlop. He was a veterinarian from Belfast who also invented the modern tire. Who knew? 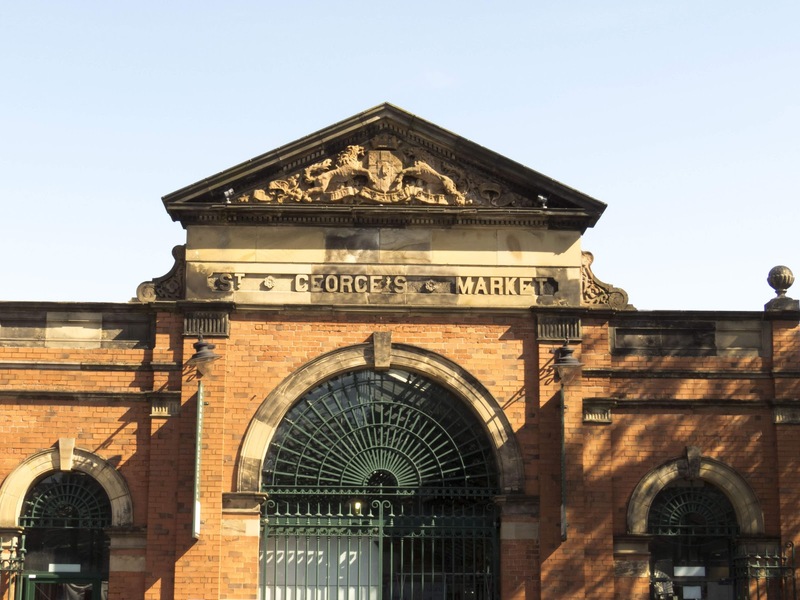 We love a good food market so were excited to check out St. George's Market in the heart of Belfast. St. George’s Market ranks among my favorite farmers markets and food halls in Europe offering a variety of eye-catching crafts to buy and delicious things to eat. Musicians often play in the central seating area and add to the great atmosphere. The music choices vary widely from Blues to Big Band. You never know what you might find at St. George’s Market and that’s part of the fun. Sampling excellent Indian food from Goloka Catering. Ordering sausages with lots of onions from Greenmount Farm. Getting a caffeine and sugar fix with a latte from Javaman and slice of coffee walnut cake. Checking out S.D. Bell’s for potent drip coffee. Browsing the great fruit and vegetables on offer at any of the produce stalls in St. George’s Market. Pick out something in season. Tickling our sweet tooth with any of the bakeries on site. On one trip we discovered a peanut butter whoopie pie. A walk along the River Lagan in Belfast offers great photo ops. 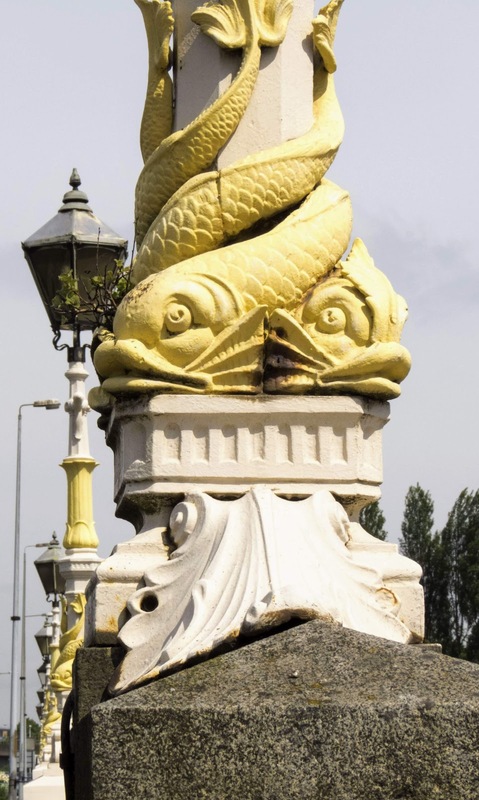 You’ll discover beautiful Victorian-era lampposts and whimsical sculptures including a giant blue fish. 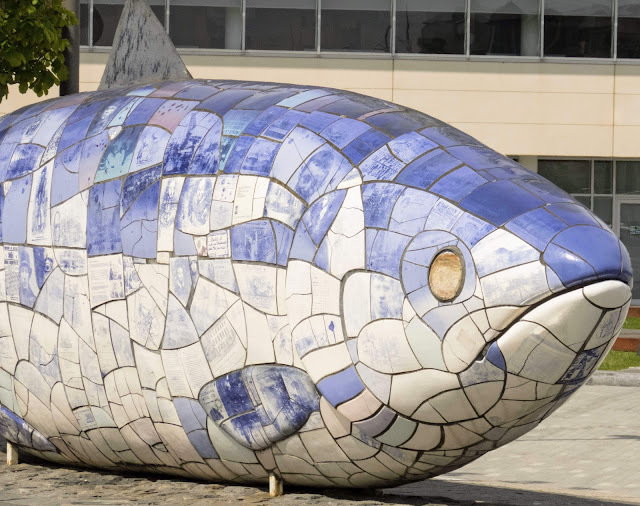 "The Big Fish Salmon of Knowledge" is made up of tiles featuring various historical news articles. Belfast features a variety of edgy street art. Seek out Commercial Court for a concentrated dose of Belfast Street Art. Some of the street art is clearly inspired by Salvador Dali. Looking down a side alley, we saw a familiar statue. Jim Larkin is on display in Belfast and also sits very prominently in the same pose on O'Connell Street in Dublin. Nearby we again got a sense of deja vu. We saw a ‘needle’ rising out of a local church that looks just like The Spire on O’Connell Street in Dublin. We enjoy reflecting on the similarities and differences between the two cities on our weekend trips from Dublin to Belfast. As we were walking along the River Lagan, we saw a geodesic dome in the distance. We could only imagine what might be inside -- a biosphere project? a planetarium? After sundown, we saw the dome again in the center of the pedestrian district. We went inside and found that it wasn't a biosphere or planetarium but rather a mall! Trek to the top of the sci-fi-esque structure for panoramic views of Belfast. I'm a big ice hockey fan so we decided to go see the Belfast Giants play on one of our trips from Dublin to Belfast. The SSE Arena in Belfast has a nice feel to it -- not too large with decent sight-lines to the ice. The Belfast Giants mascot is literally a giant and is simply over-the-top awesome. We started out with fabulous center ice seats and were settling in waiting for the first face-off when things went downhill fast. Apparently, they double-sold our seats! The other ticket holder was a season-ticket holder and of course got priority for those seats. Customer service proceeded to relocate us to another section -- this time much higher up with a view partially obstructed by a railing. Needless to say, I was not happy. To add insult to injury, this section of the arena smelled bad. At the first intermission, we escalated our complaint to the customer service manager. It took the entire intermission and first 5 minutes of play in the second period to resolve the issue but we were ultimately satisfied by better seats plus free beer and snacks for our troubles. Double-selling our original seats shouldn't have happened in the first place but at least we got it taken care of. I like how they played traditional music to celebrate the Belfast Giants' goals. It gave the match a totally different vibe than ice hockey games in the US. Our new seats were also close to two super-fans who would bang their drums to rally the crowd. This reminded us a lot of our experience watching ice hockey in St. Petersburg Russia. I also found various giveaways conducted throughout the night to be amusing. They actually gave a Pizza Hut pizza away to a fan sitting behind me. He and his friends tore through it in about five minutes! I also liked how at the end of the game, the teams formed a line to shake hands. You only see that at the end of a playoff series in the NHL. I appreciated the great sportsmanship at the end of a great evening in Belfast. Visiting Belfast from Dublin presents an opportunity to explore the troubled history of Northern Ireland. We walked to King Street and then caught a black taxi up Falls Road. Staunchly Catholic Falls Road was a key site during The Troubles that haunt Belfast's past and sometimes trickle into the present. While the conflict is often painted as a religious one, it's actually political but tends to fall along religious lines. Catholics tend to favor an independent Ireland while Protestants (originally from Scotland and encouraged to settle in Northern Ireland by the British) believe Belfast should remain aligned with the UK. The cab driver dropped us off at Milltown Cemetery where many members of the Irish Republican Army (IRA) are buried. Those that died in the cause of Irish freedom are treated as martyrs in this neighborhood. The cemetery included a memorial to several freedom fighters like Bobby Sands who died in prison from a hunger strike that last more that 60 days! 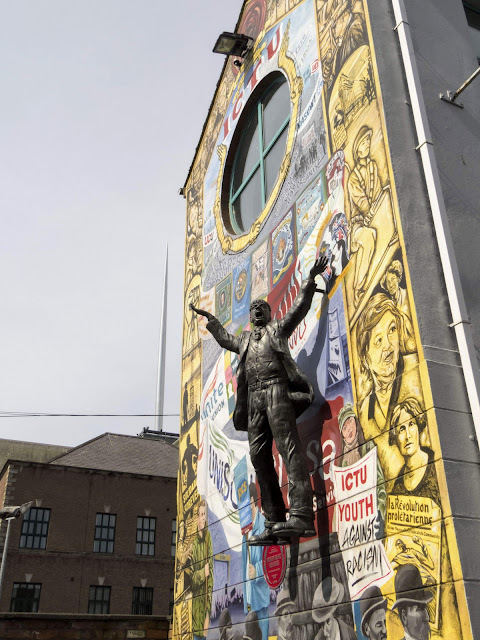 We decided to walk back to town and explore some of the political murals along Falls Road. Be aware: the murals along Falls Road can be a bit jarring. We walked past the Carnegie Branch of the Public Library on Falls Road. We then turned off the main road to see the "Peace Wall" that divides Catholic Falls Road from Protestant Shankill Road. We took a quick stroll through the Garden of Remembrance and were once again reminded of the lengths that people were willing to go in the name of Irish freedom making the ultimate sacrifice of their lives in some cases. We wanted to see both sides of the story of Belfast's troubled past. We didn't have time to visit Shankill Road but Sandy Row, a unionist enclave, was on the way back to the bus terminal and a convenient stopping point before our return from Belfast to Dublin. Similar to Falls Road, there were memorials to those who died during The Troubles. We also saw a range of disturbing murals. I found the ones on Sandy Row to be scarier in general because of the ski masks and weapons that were featured prominently in the Protestant murals. Simply chilling. Queen's University Belfast is a bit of a trek from the center of Belfast but a visit to Queens is among my favorite things to do in Belfast. The university campus was very stately with the Union Jack flying high above the main quad. We wandered into the Botanic Gardens on-campus which features an impressive Victorian-era greenhouse on the property. We stepped inside to warm up during our winter visit and were impressed by the array of flowers and plants on display inside. The wind was kicking up and the rain started to fall as we made our way across the River Lagan in Belfast to the Titanic Museum which somehow seemed fitting given the history of this vessel and it’s fateful maiden voyage. The Titanic Museum should be a ‘must’ on every visitors list of things to do in Belfast. The museum is quite popular but you can book a timed entry slot to ensure that you don’t have to queue excessively. The Titanic Museum opened in 2012 to commemorate the 100th anniversary of that fateful maiden voyage. The museum itself rose strikingly from the flat surroundings and conjured images of both a ship and iceberg in my mind. We arrived at the entrance just in time to collect our tickets and set sail. The entry hall was decked out like a grand ballroom. We wound our way through room after room of exhibits that started with the rise of Belfast as a linen-making and then ship-making hub. All the exhibits were multi-media and designed to pique curiosity and a sense of adventure. Get a glimpse into a linen weaving factory. Watch shadowy figures pass in front of old video footage of Belfast. We peered up into a replica of the scaffolding that would have surrounded the Titantic and allowed workers access to the construction site. The Titanic Museum even features a slow moving ride showing various aspects of building the ship including the work of countless riveting teams. It was something straight out of Disney's playbook. We soon approached the more sombre parts of the exhibit. Copies of the communications to and from the Titanic after she hit the iceberg sent chills up the spine: CANNOT LAST MUCH LONGER. The final room of the museum shows underwater footage of the wreck on the ocean floor 100 years later. After our tour of the Titanic Museum we wandered up the deserted road to Titanic's Dock and Pump-House. This is a truly authentic bit of Titanic history and marks where the ship was actually built in Belfast and then launched out to sea. Admittedly, the Titanic Dock and Pump-House seemed to have a smaller operating budget than the bigger museum up the road, but it was still fascinating. We wandered through rooms with all sorts of pumps and equipment. Actors recreated the experience of what it might have been like to work at the dock back in the day. We braved Belfast's rainy weather once more and carefully negotiated the slippery stairway down into the dock itself. The sides of the dock were rusted and cracked with age. Markers along the wall indicated the height. We could see the blocks upon which the hull of the Titanic once sat. An assortment of stone blocks sat off to the side. After connecting with the Titanic in this place where she once set sail, we sought to get out of the cold weather and into a pub to reflect on our visit and warm up before our return from Belfast to Dublin. Belfast Castle is worth a short visit if you are a repeat visitor to Northern Ireland. Belfast Castle can be a little tricky to get to on public transport but it is possible. You can take the bus for about 20 minutes to the Strathmore Park stop and then take a 15 minute walk uphill through a residential neighborhood and then a park. 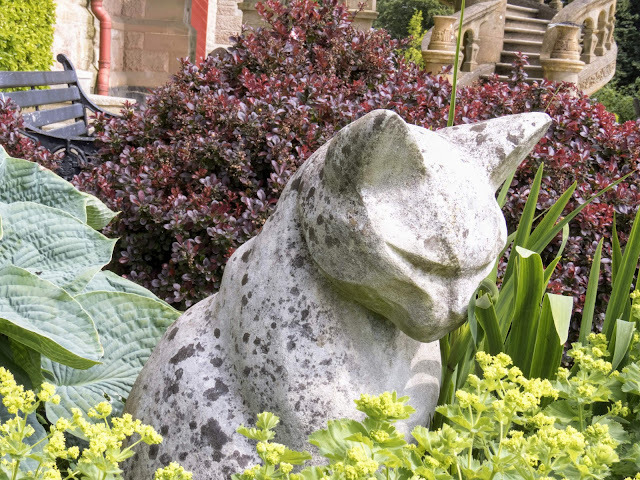 Belfast Castle features a lovely garden with a cat motif. See how many cat sculptures you can find as you walk around the small space anchored by a fountain. Belfast Castle has a cafe onsite if you fancy a coffee or a snack. Parts of the interior are open at times but sometimes close for private events (most of the interior of Belfast Castle, aside from the cafe, was closed for a wedding during our visit). Check out the unusual spiral staircase at the back of the castle as you enjoy sweeping views over Belfast City. Finish your visit to Belfast Castle with a walk on one of the many hiking trails through the woods above the castle but beware, the trails are not super-well marked and it is possible to get turned around or lost. Take the train to the seaside town of Bangor if you visit Belfast in the Spring or Summer. The train ride from Belfast to Bangor takes about an hour. Take time to wander through Bangor Town to the harbour. Depending on the time of year (we visited in the Spring), you may see black guillemots nesting in the cracks in the concrete along the water. Consider renting a swan peddleboat at Pickie Funpark right next to the Bangor Harbour. Our favorite spot in Bangor was the Bangor Castle Walled Garden. Bangor Castle has been converted into the Bangor Town Hall with a regional museum (North Down Museum) immediately behind it. Hike through the enchanting Bangor Castle park through a lush forest until you emerge at the walled garden. Walk around the flowerbeds and keep an eye out for modern and edgy sculpture. Grab a coffee at the cafe in the Bangor Castle Walled Garden to keep your energy up for the rest of your Belfast to Bangor day trip. Belfast had advertised a 'Continental' Christmas Market near City Hall which is one of the key reasons we decided to make the journey to Belfast from Dublin in December. We were looking forward to a little glühwein to warm up from the cold rain. Getting into the spirit, we waved to Santa as the Santa Bus drove past. The citizens of Belfast are a hearty bunch and there were a decent number of people out despite the bad weather. The only thing missing was the signature souvenir mug that you'd expect to find at a 'continental' market. We were even more disappointed because the advertisement for the market specifically said that there would be mugs! Oh well...perhaps they were so popular that they sold out two weeks before Christmas. Home Restaurant is a great place to stop for lunch in the center of Belfast. Situated just a block away from Belfast City Hall, you can't get more central than this. Sip a glass of wine with a chickpea-based vegetarian stew or enjoy grilled chicken with quinoa. The fresh, simple dishes are quite satisfying. 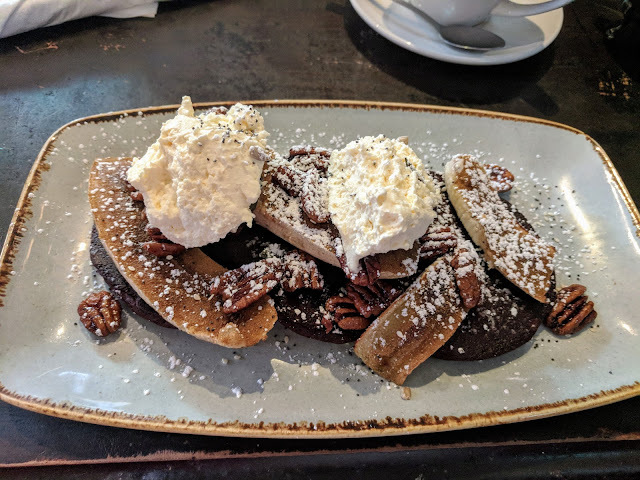 Sit down to a decadent brunch at Home Cafe including American-style red velvet pancakes with bananas and pecans. Balance that out with a stuffed omelette and side of toast for a bit of protein. Harlem Cafe is extremely popular so go early or be prepared to wait for a table. Grab some award-wining fish and chips on the go in the central Belfast shopping district at Fish City Belfast in the pedestrianized core of the city. 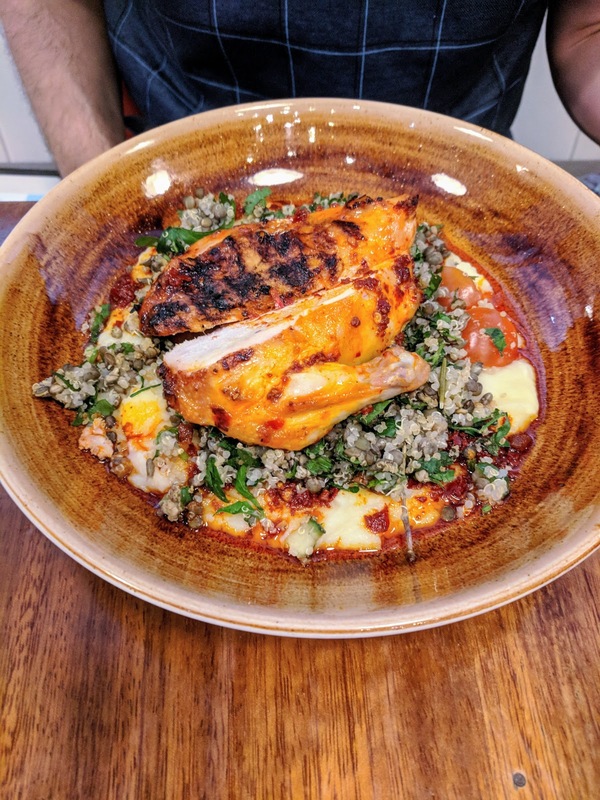 Nestled in the Queen's University Quarter of Belfast, Molly's Yard restaurant offers high-end cuisine in an intimate setting. Imaginative seasonal ingredients go into each dish. Molly's Yard is pretty small so make sure to book ahead, especially on the weekend. 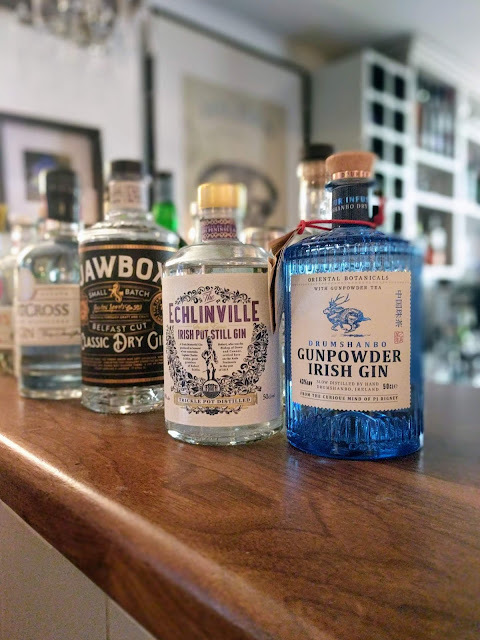 Pair your meal with a local craft beer or a gin-based cocktail. 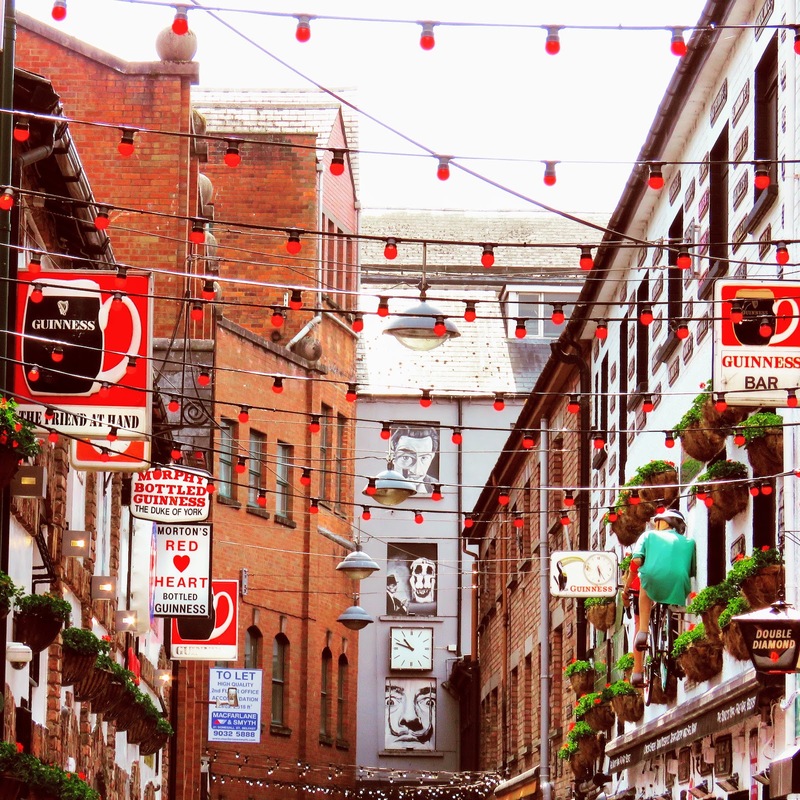 Belfast’s Cathedral Quarter is home to the intriguing Bittles Bar. The place was packed but we timed it well and managed to find a small table tucked in the corner. We tried a few of the craft brews and ciders on offer including Pig Island Pale from Ards Brewing Company and MacIvor's Cider. We admired the paintings of various Irish writers and politicians surrounding us on all sides. We definitely felt an additional bit of Christmas spirit when the family at the next table busted out McCoy's Salt and Malt Vinegar Potato Chips and proceeded to hand us two personal sized bags. My favorite! We stopped for soup and a beer at the Crown Liquor Saloon, a classic Belfast establishment. The interior of the Crown Liquor Saloon was particularly impressive with stained glass by the entry. Belfast is known for its pubs and most importantly for snugs. At Crown Liquor Saloon we got to see a snug first hand. Belfast is known for pubs with these cozy booths with doors that close for privacy. The Crown Liquor Saloon is one of the best period pubs I've seen. We got lucky when we arrived. All the snugs were full but we met a nice couple from the UK who were just getting ready to leave and invited us to sit down. We settled in for a relaxing pint of Harp. Snugs are like a mini-oasis with dark wood paneling, stained glass, and a door that closes out the any rowdy lads at the bar. In the good old days, you could even ring this bell and someone would come to take your order and deliver your drinks. Unfortunately, it's all self-service now but still good fun! 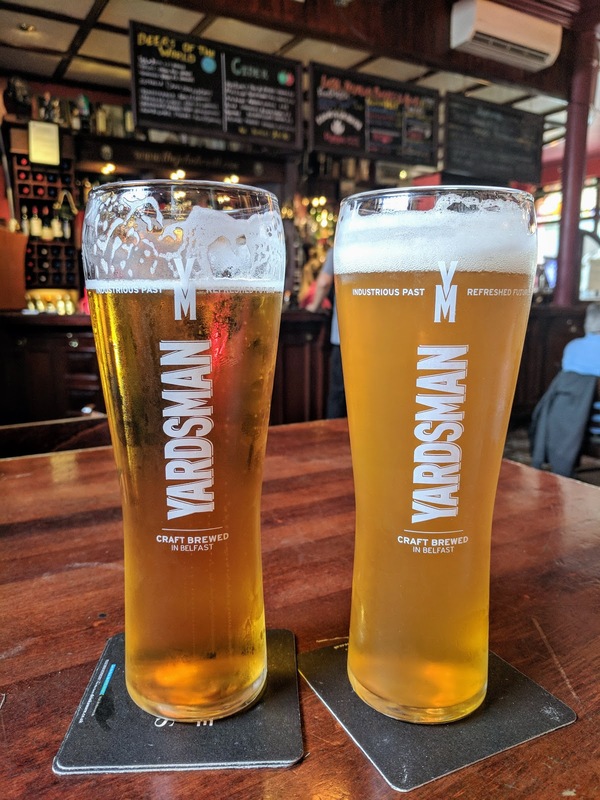 Grab a sneaky afternoon pint of Yardsman, a local craft beer brewed in Belfast, at John Hewitt Bar in the Cathedral Quarter. You may even encounter some live music on a Saturday afternoon. The Woodworkers Bar in the Queen's University Quarter of Belfast is a great spot to relax at the bar with a newspaper while the world buzzes around you. Serving local and imported craft beer, the Woodworkers Bar is a modern boozer. 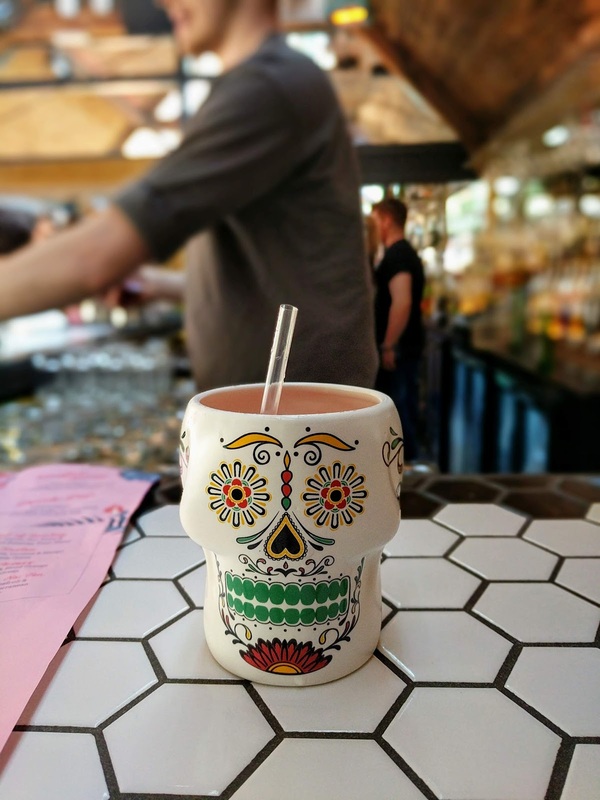 For the ultimate upscale drinking experience in Belfast, check out The Perch Rooftop Bar. Take the lift to the top of an office building that has seen better days and emerge into a light filled bar. Grab a specialty cocktail on a sunny Sunday afternoon. Katy's Bar is a great spot for a quiet drink on a weekday afternoon in Belfast. Bask in the old school wood-paneling and hunting trophies on the wall while sipping a pint of stout. When visiting Belfast, I recommend staying at one of the three Premier Inns located in Belfast City Centre. Premier Inns are no frills but clean and comfortable with a guarantee of a good night’s sleep. I also owe the Premier Inn a debt of gratitude. On a business trip to Belfast, I had booked the posh Hotel Europa. Apparently, I got my dates mixed up and had booked in for the next day. Hotel Europa was fully booked. The staff was actually quite rude to me as we slowly troubleshooted the reservation and figured out what happened. Hotel rooms in the city were super hard to come by since Dolly Parton happened to be in Belfast that evening. I wasn’t sure what I was going to do. I called up the Premier Inn and they miraculously found a room for me and at a very reasonable rate. The Premier Inn staff is always incredibly friendly and I’ve been a loyal customer ever since. Hotel Europa has the distinction of being Europe's most bombed hotel. I considered staying there on one of my trips to Belfast as discussed above. Given the unprofessional treatment after an honest mistake, I can’t in good conscience recommend them. Take a photo from outside or pop in to see this historical site in Belfast but in my opinion you should stay elsewhere. For more details about the cool things to do in Belfast referenced in this post, check out this handy Belfast map. I have generally felt safe during my four visits to Belfast. There are still bomb threats on occasion but the people placing the bombs generally give ample warning so that bystanders can clear the area. The authorities in Belfast are good at getting the word out about any bomb threats, clearing the area and diffusing the situation. It’s clear that in some cases Belfast is still struggling to escape the past. On one of our weekend trips, our bus was actually delayed and sent on a significant detour because of a bomb threat on a bridge along the highway. On another trip, we logged into the free wi-fi at a pub and discovered that a bomb had gone off in Belfast's Cathedral Quarter the night before (the very neighborhood in which we were sitting at that moment). Fortunately, no one was hurt. It's sad that The Troubles still continue in this part of the world. The good thing is that most people seemed undeterred by the previous day's excitement. The city appeared normal and calm to us -- like any other in Europe, but clearly tension still rests just below the surface. This tension tends to reach a peak in July in the lead up to The Twelfth (celebrations by protestants in Northern Ireland beyond that involve marches and parades that have provoked violence in the past). I recommend avoiding Belfast specifically and Northern Ireland in general at this time of year. In general, don't let the rough history of Northern Ireland deter your visit. Use common sense and be aware of your surroundings but tourists generally won't have issues when visiting Belfast. 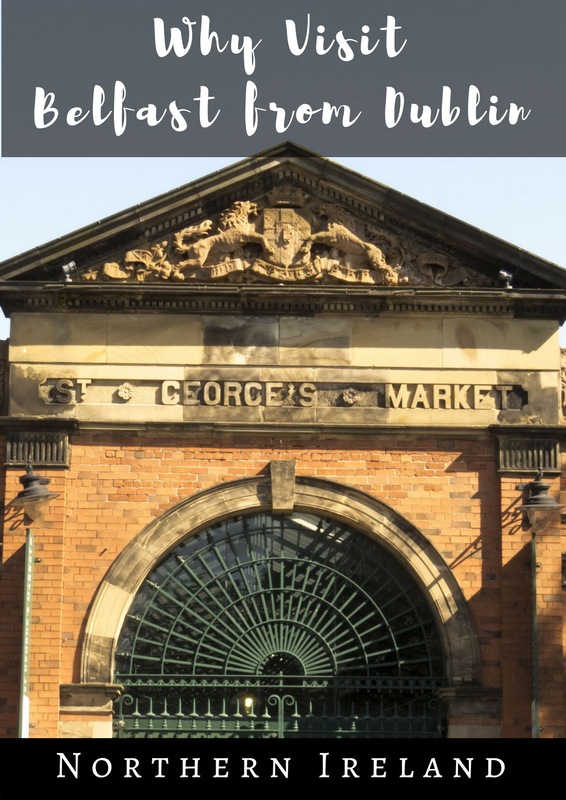 Find out why you should visit Belfast from Dublin. 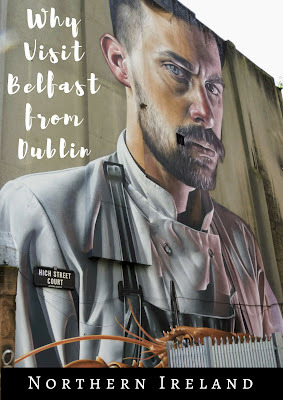 Learn about things to do in Belfast on a weekend city break from Dublin. Discover Belfast points of interest including day trips around Belfast.